Our estheticians use the most gentle, hygienic product available—Nudess Nufree. It’s botanically based and is technically not a wax, so it won’t stick to skin or cause irritation. And it’s antimicrobial and antibacterial, giving you a completely sanitary hair removal experience. Nudess Nufree is the ideal product to get rid of stubborn hair with as little discomfort as possible—even on the most sensitive skin. 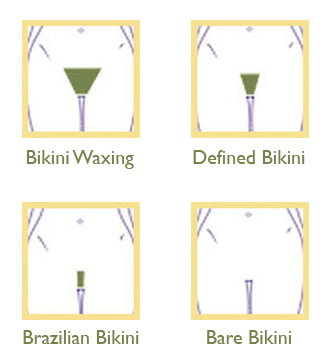 When you’re looking for something a little more defined than the basic bikini but you don’t want to take it all the way to a Brazilian, this is the service for you. We’ll take off excess hair along the sides and at the top so you can wear an itty-bitty swimsuit bottom, but you won’t feel too bare. Come experience the Brazilian mystique. You (and that special someone) will love it!